For more photos of this event by Kevin Nagle, go here. 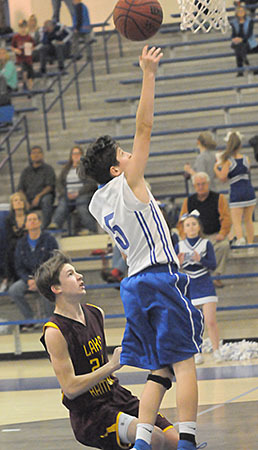 The game was just seconds more that a minute in when the Lake Hamilton Wolves eighth grade team took a timeout. 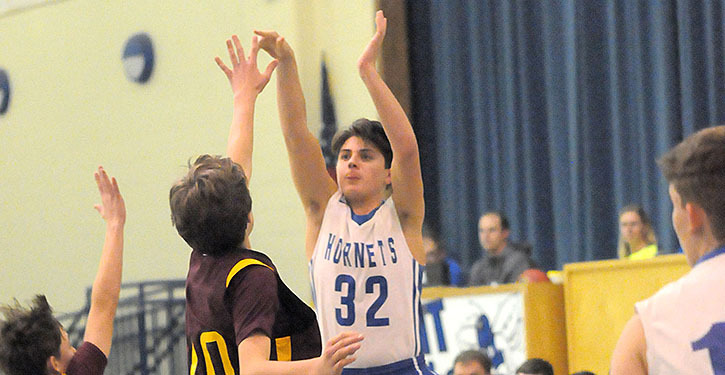 It had only taken that long for the Bryant Blue Hornets eighth grade team of Bethel Middle School to rush to a 7-0 lead Thursday night at the Bryant Middle School gym. And they never trailed on their way to a 42-24 thumping of the Wolves. Brayden Godwin started that opening salvo with a 3-pointer. Landon Nelson made a steal and a layup then, off another Lake Hamilton turnover, Hayden Schrader drove for an easy deuce. The Hornets wound up forcing 23 turnovers in the game. “I thought we played well defensively,” acknowledged Bethel head coach Steve Wilson. “We were a little stagnant on offense at the start but our full court defense helped create some offense for us. 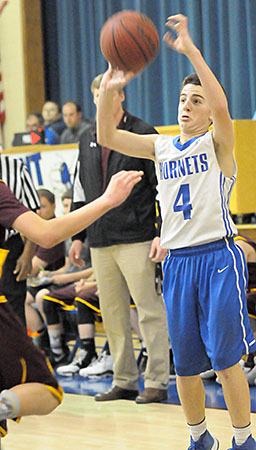 Godwin wound up leading the Hornets with 9 points. Austin Schroeder and Schrader had 7 each and Ryan Riggs, in off the bench, scored 5 as 17 players got into the contest. Lake Hamilton got on the board after that early timeout but Schrader added a free throw and Braden Robinson scored inside after gathering an offensive rebound. Off a Lake Hamilton turnover, Godwin hit a layup and the Hornets’ lead was 12-2 with just over two minutes left in the opening stanza. Another free throw was all the Wolves could muster before the end of the quarter. When the second period started, Schrader scored down low again then followed up with a steal that got him to the free-throw line and resulted in another Wolves timeout. They would cut it to 14-6 but Godwin converted two free throws and, after a basket by Lake Hamilton, Riggs nailed a 3 to push the margin tow 11. It was 19-10 at the half. The Wolves managed to trim the margin to 23-15 midway through the third quarter but the Hornets then went on an 11-3 blitz, ignited by Schrader who followed his own miss and scored. After a Lake Hamilton 3, Jackson Lindsey scored. Schroeder made a steal and layup then, after a Wolves’ miss, knocked down a 3. Riggs hit a 15-footer and it was 34-18. The lead was never less that 15 after that. 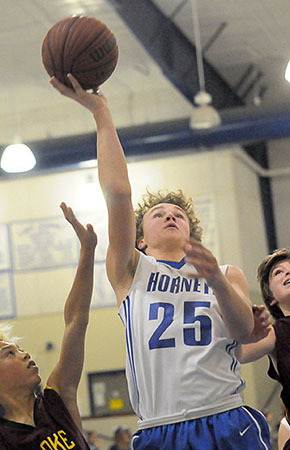 Lindsey opened the fourth quarter scoring and Lake Hamilton answered. 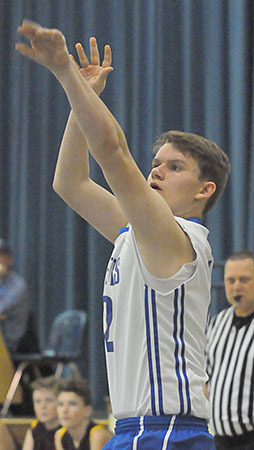 An offensive rebound basket by Robinson made it 38-21 and, after a free throw for the Wolves, Ethan Andrews sank a 12-footer to push the lead to 18. 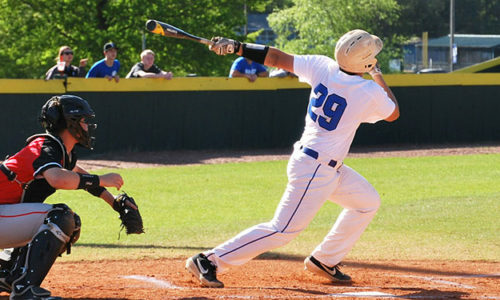 Now 7-5 on the season, Bryant Blue is scheduled to play again Monday at home against North Little Rock. Johnson 0-1 0-0 0, Harris 1-1 2-4 4, Bardwell 1-1 0-0 2, Porter 0-4 0-0 0, Hale 2-3 0-0 6, Smith 0-2 1-2 1, Speer 0-0 0-0 0, Emmett 0-0 0-0 0, Rhodes 4-6 3-6 11, Prater 0-0 0-0 0, Drakes 0-1 0-0 0, Hardcastle 0-0 0-0 0, Taylor 1-1 0-0 3, Richardson 0-1 0-0 0, Nash 0-0 0-0 0, Hartman 0-0 0-0 0. Totals 9-21 6-12 27. Robinson 2-5 0-0 4, Nelson 1-6 2-2 4, Schroeder 3-9 0-2 7, Godwin 3-11 2-2 9, Schrader 3-5 1-4 7, Lindsey 2-2 0-0 4, Mathews 0-2 0-0 0, Orender 0-0 0-0 0, Adams 0-0 0-0 0, Riggs 2-3 0-0 5, McDonald 0-1 0-0 0, Redam 0-2 0-0 0, Andrews 1-1 0-0 2, Purdy 0-0 0-0 0, Metcalf 0-0 0-0 0, Overton 0-0 0-0 0, Geissler 0-0 0-0 0. Totals 17-47 5-10 42. Three-point field goals: Bryant Blue 3-14 (Schroeder 1-4, Godwin 1-4, Riggs 1-1, Nelson 0-2, Mathews 0-2, McDonald 0-1), Lake Hamilton 3-7 (Hale 2-3, Taylor 1-1, Porter 0-2, Richardson 0-1). Turnovers: Bryant Blue 15, Lake Hamilton 23. Rebounds: Bryant Blue 9-14 23 (Robinson 0-5 5, Schrader 3-1 4, Nelson 2-1 3, Schroeder 1-1 2, Godwin 1-1 2, Mathews 0-2 2, Lindsey 0-1 1, Adams 0-1 1, Riggs 1-0 1, Purdy 0-1 1, team 1-0 1), Lake Hamilton 5-14 19 (Bardwell 0-4 4, Rhodes 2-2 4, Hale 0-3 3, Johnson 0-2 2, Smith 1-1 2, Harris 1-0 1, Porter 0-1 1, Prater 1-0 1, team 0-2 2). Team fouls: Bryant 14, Lake Hamilton 9. Technical foul: Lake Hamilton, Bardwell.